Santa Rita (Guam): Naval ships, aircraft and personnel from India, Japan and the US have begun exercise Malabar 2018 during which they will practice surface and anti-submarine warfare operations and combined carrier strike group operations off the coast of Guam island in the western Pacific. "The Malabar 2018 exercise represents the US commitment to working with regional powers in the Indian and Pacific Oceans," US Secretary of Defense James Mattis said when he announced the new name and welcomed Admiral Phil Davidson in his new role taking the charge of the combat command. 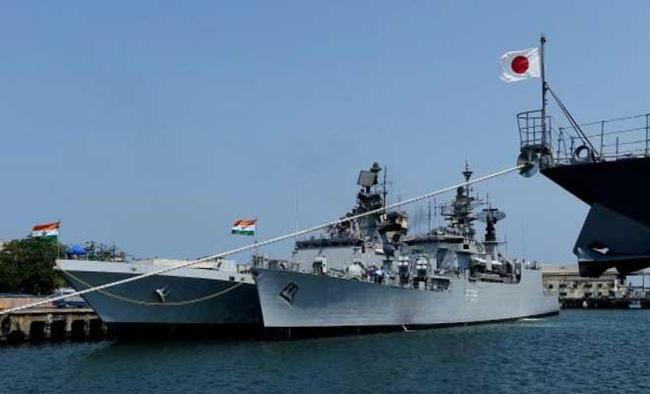 Malabar will be done in two phases: ashore and at-sea training. The harbour phrase will occur at Naval Base Guam from June 7 to 10 and the sea phase from June 11 to 16 in the Philippine Sea.Guam island was a theatre of an intense World War II when US forces stormed in to take it from the Japanese. The at-sea part will see military-to-military coordination and capacity to plan and execute tactical operations in a multinational environment.The statement said events planned during the at-sea portions include gunnery exercises, anti-submarine warfare, air defense exercises, surface warfare exercises, helicopter cross-deck evolutions and underway replenishments. Japan became a permanent participant in 2015. Australia, in the last two years, had repeatedly requested to be part of the annual drill but India again refused after China raised is concerns.The US Navy has fielded aircraft carrier USS Ronald Reagan (CVN 76), the guided-missile cruisers USS Antietam (CG 54) and USS Chancellorsville (CG 62), the guided-missile destroyer USS Benfold (DDG 65) and a P-8A Poseidon aircraft. Three ships from the Japan Maritime Self Defense Force are: the 19,000-tonne JS Hyuga - the lead ship of the Hyuga-class of helicopter carriers; the Takanami-class guided-missile/ASW destroyer JS Suzunami; the Akizuki-class guided-missile destroyer JS Fuyuzuki; and a diesel-electric attack submarine, as well as one Kawasaki P-1 maritime patrol aircraft..
"Indian, Japanese and US maritime forces have a common understanding and knowledge of a shared working environment at sea. Each iteration of this exercise helps to advance the level of understanding between the nations' sailors as members of Indo-Pacific nations, and the hope is to be able to continue this process over time to strengthen bonds and personal relationships," the US Navy statement said.